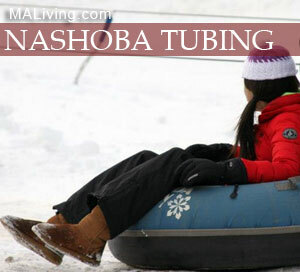 Open seven days a week throughout the winter months, the Nashoba Valley Snow Tubing Park is fun for the whole family. Whether you hit the lanes during the day or at night, Nashoba celebrates one of the fastest growing winter recreational activities for all age groups by being the largest snow tube park in New England. Not a skier or snowboarder? Never fear. Nashoba Valley offers New England’s largest Snow Tubing park, seven days a week, for serious outdoor winter fun for all ages. Open from 1pm to 10 pm on weekdays and 9am to 10pm on weekends, the 18 lanes at the snow tubing park is a great source of group fun or birthday party shenanigans. Children 6 years and older can hit the lanes as long as they are at least 42′ tall. Normally tubing is only allowed with one person per tube, but doubles are sometimes allowed, depending upon conditions. Tubes are provided by Nashoba. Be sure to bundle up in layers and dress warm with snow pants, gloves and snow boots. Pay particular attention to layers if you plan to go tubing at night, as the temeratures drop with the sun.